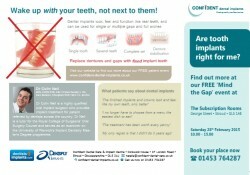 Could you or someone you know benefit from or would like to find out more about dental implants? Do you have friends, relatives or colleagues who have lost one or more of their natural teeth? 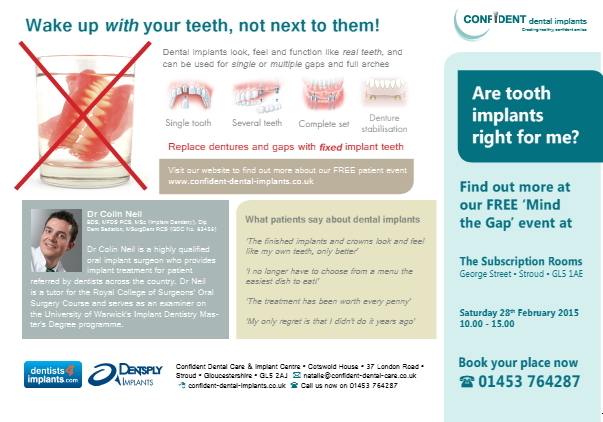 Is anyone you know embarrassed by loose dentures, failing bridgework or unsightly gaps where their teeth used to be? 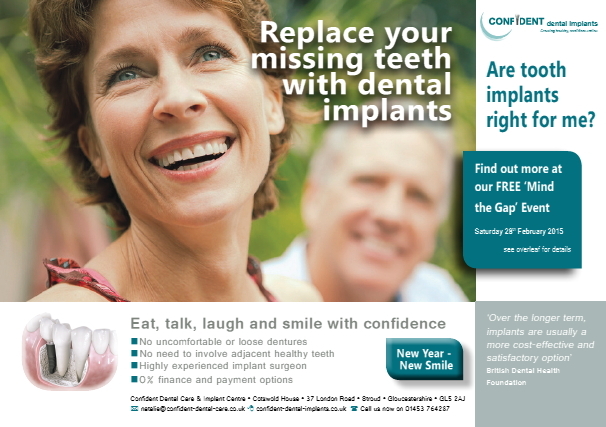 If you would like to find out more about replacing problem, failing or missing teeth with dental implants and how this treatment can improve your quality of life with improved chewing, function, appearance and boost your confidence with “new teeth for the new year”, with our resident expert oral surgeon, implant dentist Dr. Colin Neil BDS, MFDS RCS, MSc (Implant Dentistry) Dip Dent Sedation, MSurgDent RCS (GDC=83459) please contact us on 01453 595144 quoting “Mind The Gap – implant outreach event” to arrange to attend our special free patient information event, being held at Stroud Subscription Rooms on Saturday February 28th 2015 from 10am to 3pm. You will have the chance to see examples of treatment and meet other patients similar to you who have already benefitted from this treatment and enhanced their quality of life to smile, chew, laugh and even kiss confidently! 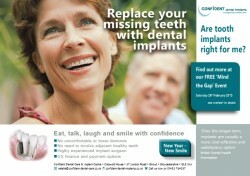 Implants are your solution to gaps and loose dentures!